Does a Nuchal Cord Increase Risk of Stillbirth? Does a Nuchal Cord Increase the Risk of Stillbirth? The term "nuchal cord" refers to the condition in which the umbilical cord is wrapped one or more times around an unborn baby's neck. At first, this may sound like a condition that would pose a serious risk of choking the baby in the womb. However, that is not usually the case—about 6 in 1,000 cases result in stillbirth—and the majority of babies are born healthy. A nuchal cord is a fairly common condition, occurring in less one-third of all deliveries. The potential that it will happen increases with gestational age. For instance, studies have found that at 20 weeks, nuchal cords occur in just 6 percent of pregnancies and by 42 weeks that increase to 29 percent. There are two types of nuchal cords—Type A and Type B—and one or more loops around the neck can occur. Each of these is a factor in the severity of the condition. Type A means that the cord is loosely wrapped, leaving the possibility of becoming unwrapped on its own. This type is rarely problematic and occurs in about 21 percent of all pregnancies. It is usually managed by a physician or trained midwife slipping the cord over the baby's neck during delivery to prevent compression. Type B means that the cord is more tightly wrapped around the baby's neck and it is present in around 6 percent of pregnancies. Researchers are continuing to focus efforts on this condition to better understand the signs, symptoms, and effects of it, both on the fetus and the baby after birth. Unfortunately, the results of studies vary in their findings. In a few studies, type B nuchal cords appear to cause an increased incidence of C-sections. However, most studies find no significantly increased risk of complications with any type of ultrasound-detected nuchal cord. Some research is showing that male fetuses are more likely to develop this condition. Most conclusions agree that there is no increased incidence due to a mother's age, the baby's birth weight, or similar factors. Though rare, a tight cord-around-the-neck (tCAN) may result in a few cardio-respiratory complications. These include a reduction in blood pressure or circulation due to the decreased ability of fluids to flow through the umbilical cord. It may also cause respiratory distress. The number of times the umbilical cord wraps around the neck and the length of the umbilical cord can play a role in the severity of the condition as well. One study found that a one-loop nuchal cord was not associated with adverse outcomes. Two or three loops, however, was more likely to result in a decreased fetus growth and, potentially, other complications. With longer umbilical cords and identical twins, it is possible (though rare) for an umbilical cord to actually form a knot within itself. This may disrupt the flow of oxygen to the fetus if it is pulled too tight and a C-section may be required. If it occurs earlier than 20 weeks into the pregnancy, it may result in miscarriage. However, knots occur in about 1 percent of all pregnancies. In understanding nuchal cords, it helps to keep in mind that unborn babies don't breathe through their mouths in the womb. Instead, oxygen is delivered through the mother's blood via the placenta and umbilical cord. 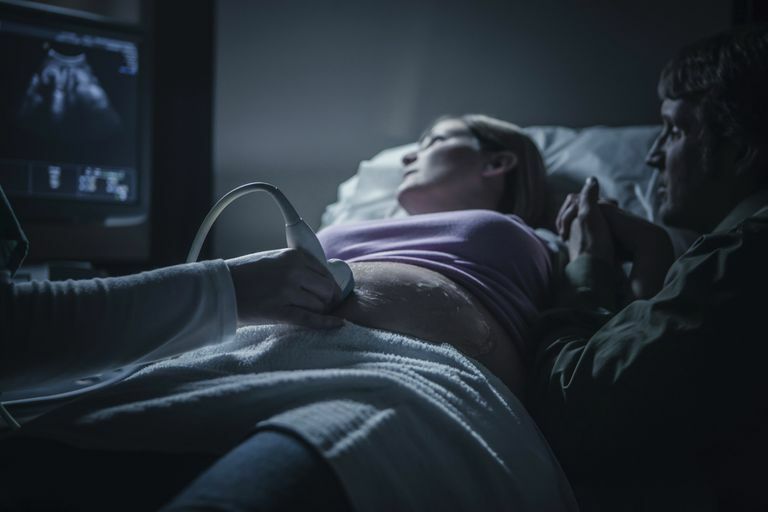 The cord is constructed in such a way that the normal movements and somersaults of an unborn baby usually won't disrupt blood flow through the cord. It has layers of protection that are designed to minimize damage and constriction, including a sticky substance called Wharton's jelly and a membrane called the amnion. Prior to delivery, a nuchal cord may become apparent during an ultrasound. A decrease in the fetal heartbeat can also be a sign that requires further investigation, with a nuchal cord as one potential cause. Typically, if anything is found that indicates a nuchal cord, you will be more closely monitored through the duration of your pregnancy. During delivery, trained doctors or midwives know to monitor for a nuchal cord. If it's noticed, they will take appropriate intervention measures when needed. For all these reasons, it is rare that the condition causes any problems. While it is understandable that a nuchal cord will be a cause for concern in your pregnancy, rest assured that it is common. Even more so, it is very rare for it to result in severe side effects or a stillbirth. Be sure to ask your caregiver any questions you have about your condition because each case will be different. March of Dimes. Umbilical Cord Abnormalities. 2016. Moldenhauer JS, et al. Fetus or Newborn Problems: Nuchal Cord. Merck Manual. 2018. Peesay M. Nuchal Cord and Its Complications. Maternal Health, Neonatology and Perinatology. 2017;3:28. http://dx.doi.org/10.1186/s40748-017-0068-7. Shreiber H, et al. Multiple Nuchal Cord Loops and Neonatal Outcomes. American Journal of Obstetrics & Gynecology. 2018;218(1):S91. https://doi.org/10.1016/j.ajog.2017.10.104. Royal College of Obstetricians and Gynaecologists. Caesarean Section for Nuchal Cord—Query Bank. 2016. Does an Abortion Increase the Risk of Pregnancy Complications?